Why is the graph freaking out? What does each dip represent? What if there were TVs in every bathroom? What would this look like then? ...i don't want to skip, but you showed us this one today at OAME so the mystery is gone. super cool. How many people are going to the bathroom during breaks? Why is it higher in that first hour, compared to the previous day? Why are there big spikes in the blue graph? Why is Canada so awesome at hockey? When were the breaks between periods? What happened at 4:00 pm? What part of the game does each peak/valley represent? What proportion on viewers went to the bathroom between periods? Why are their drops in water consumption, and then peaks right after? Are the spikes from before the game and during the period breaks? What causes the huge, brief spikes? What happended to cause the peaks -- did they score? Were there commercials at the times of the peaks? Why the peaks and valley's? Why the peaks and valleys? How much water was saved compared to the previous year? why do spikes get bigger? what was the mini spike at 16:00? What caused the peaks and troughs? What time are the spikes and what do they line up with in the hockey game? What accounts for the pronounced, periodic spikes? How long is one period of an Olympic hockey game? What happened on Feb 28? What was happening during each of the spikes? What is occurring on Feb 28th? What caused the change in the middle? why are there sharp peaks and valleys on the 28th? Why did they do water consumption and not hits per game? What is with the 28th? Does the green curve represent an average day? What caused the peaks and valleys? 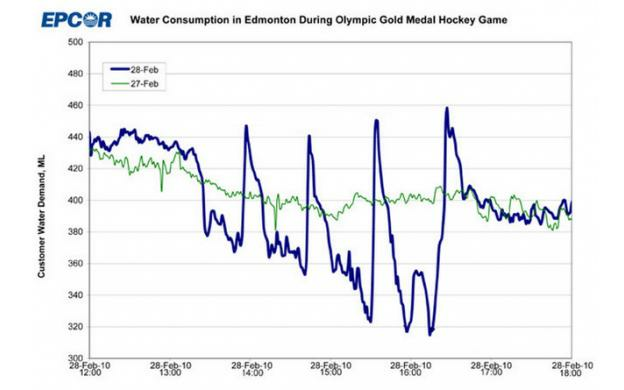 It appears that there was less water consumed overall during the Olympic game. But given consumption, this doesn't make sense. Are the areas under the curves equal? And how do we define consumption? Why is there so much variation between hour 13 and hour 16? What happened on 28th Feb? what is happening during the high peaks and the low peaks? What was happening when the water consumption will be at its lowest? How do the spikes correlate with when the Zamboni enters the rink? What was probably happening every hour on Feb 28th from 13:00 until 17:00? How many toilets flushing is there during the first period intermission? Explain the peaks and dips of the blue line. Expalin why the difference between the highs and lows get bigger? Do the peaks correspond to ad breaks? Why are their all the peaks and valleys?